Max, can you briefly walk us through your story – how you started and how you got to where you are today. I am an artist and a curator. Meaning that I make and exhibit my large scale abstract paintings in galleries and museums around the world AND I organize exhibitions of the art work of other artists, both in an institutional setting (the Torrance Art Museum) but also with Durden & Ray and ARTRA. Originally I am from London, but I came to LA about 20 years ago. After coming out here to do some exhibitions of my own paintings I was fortunate enough to have the opportunity to move here permanently. I gave up my position as a Professor of art at a university in England and moved out. In 1998, a year after arriving, I started an alternative gallery called Raid Projects, in Santa Ana. With the help of artist friends, we managed to build a very solid reputation for ambitious and cutting edge art exhibitions. 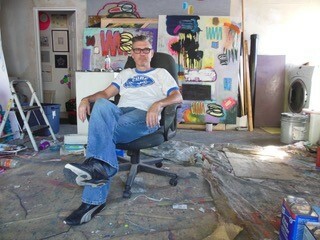 In 2001, I moved the gallery to the Brewery in downtown LA. We continued our program with hot emerging artists, international stars, exciting students and much more, while building an international artist-in-residency program too. With many international exchanges, art fair participation and such we grew to become an established and respected space for new art. Mark Moore Gallery headhunted me in 2005 so I became the Director there, while maintaining my position as Director of Raid Projects. Hard going and I managed that until 2008 when I stepped down from Raid and eventually left Mark Moore Gallery in 2009 to move to the Torrance Art Museum as Director and Head Curator. As a painter, I have been very fortunate to have been offered many exhibition opportunities with galleries worldwide, with representation in LA, Beijing, Brisbane, Tokyo and work available in other cities around the world. This takes attention and persistence and vast amounts of patience!! It has been a necessary balance to the curatorial work and remains my core, the reason behind my being. Having a supportive spouse, LaLena Lewark, has made it not only possible but helped keep it integral to who and what I am. With the economic downturn biting into artists particularly hard I founded ARTRA, with Colton Stenke in 2009, to help provide artists with exhibition opportunities. We added Jason Ramos to our ranks and then Kio Griffith, when Jason left. We continue our one-off projects for artists, all of them done as volunteers with no financial transactions involved. To further this aim, I founded a collaborative artists group, Durden and Ray, with Roni Feldman, in 2010 which grew into its own downtown LA gallery space and has 24 members now and focusses primarily on international exchanges, taking LA artists and their art around the world and bringing art from those countries to the gallery to expose our audiences to global perspectives. At TAM, we have strived to be the best small contemporary art museum in LA. We bring some of the best known artists from around the world to Torrance and mix them in with young artists on the cusp of greatness. It has been a wonderful and engaging time, albeit difficult with a tiny budget and a tiny staff but we continue to grow in reputation!! Our concentration on unusual themes, supportive approach to allowing artists to select their own work for exhibitions, open and accessible to visitors and relaxed attitude make TAM a gem for visual art in SoCal. It is always a struggle!! There is too little money in art, outside of the big ticket items bought by billionaires, which is a long distance away from where 99% of artists work. To help them succeed is a long road with many turns and no signposts! One becomes involved in this for love, not money!! For ARTRA – Trying to find a large venue for free, to show the artists, is hard. How to produce PR for zero dollars requires hard work and ingenuity, for which I am eternally grateful for all of those who have stepped up over the years. For TAM – getting people to travel down to Torrance was a big ask at first but has become easier over the 8 years I have been here. Tiny budgets do not make life easier, as you would expect. Regardless, the rewards far exceed the problems. For a small regional art museum that only shows contemporary art in a beautiful space with no money……. we have an awesome track record of discovering new artists who have gone on to fame and fortune. We do our homework, we look at everything and we have a keen eye for talent. Many of today’s young stars had their first museum experience with TAM. Our current team of Ben Tippin and Melissa Tran do a super job and are amazing at getting so much done with so little time!! We have a very experimental approach to curating methodologies, a very personable relationship with the artists, an informal interaction with our audiences and a fun program. You can come in, it’s always free, see the shows, chat with staff and even talk directly to the curators (unheard of in most art museums). We are an open and inviting place and people can become personally involved with our projects, feeling an intimate connection with the TAM. How many art museums can you say that about? LA in general is an excellent place for most businesses, I think. It is especially a good place for art and artists. It is generally recognized that after New York and London – due to the number of galleries and high-end sales – it is Berlin and Los Angeles that are thought of as the real hot spots for contemporary art. NYC and London are too expensive for most artists to live and work in so Berlin and LA have become, over the last decade, THE locations for some of the best art being made on the planet. With the explosion of new art galleries in LA over the last 3 years we are all fortunate enough to be able to see the best and brightest in this region. We hope TAM plays a significant role in that. Terrific article! Fantastic endeavors by Max Presneill…he is inspiring. I’m familiar with the breadth this article/interview speaks of when enumerating Max Presneill’s accomplishments with and for artists in the LA area and beyond, my having attended or participated in numerous Torrance Art Museum events. Presneill’s innovation within the context of artist-museum and artist-gallery relationships, alongside a huge generosity of spirit, has transformed existing examples of how a small museum can relate to its community and the larger region. It is rare that a director is, in addition, a successful artist in his/her own right. Thanks for this informative interview!